John Edwards (double bass) and Mark Sanders (drums) were my musicians of the year for 2016. Although I was aware of them, somehow I hadn’t realised what an outstanding rhythm section they are (though such a description only scratches the surface). Last year I saw them twice – first, with Frank Paul Schubert (saxes) and Matthias Müller (trombone) as Foils Quartet in Weikersheim, where Edwards played one of the most spectacular bass solos I’ve ever heard, and then in a superb show with Roscoe Mitchell at the Métèo Festival in Mulhouse. They‘re able to lift a good performance to a great one. 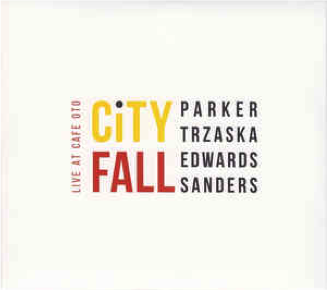 Their history with Evan Parker goes back to the wonderful 1997 FMP release London Air Lift (with guitarist John Russell) and the equally splendid The Two Seasons (Emanem, 2000). Since then Edwards has joined Parker in various groups and he and Sanders have become a potent, and ubiquitous, pairing. With the exception of Spring Heel Jack’s The Sweetness of the Water however, the three have never recorded in the same band again, until this album. Edwards’ and Sanders’ qualities lie in their acute ears and subtlety, as heard at the beginning of in “In Case of Fire“ – both are top-flight free players who complement the two horns. Sanders’ drumming pumps and pushes, full of ringing and shimmering details, while Edwards is both lyrical and brutally energetic, full of unexpected twists and turns, refining Barry Guy’s “all-over“ approach. In the first minutes of the recording he even sounds like an alternative rock bassist gone wild. And then there are the two reeds. No one who follows this blog doubts Evan Parker’s virtuosic tenor technique – elaborate and spectacular (his circular breathing solos) – but he’s not out to impress. He rather concentrates on timing and placement, the correct cue to contribute something important. Here, it’s the ease with which he counters the quicksilver runs of Mikołaj Trzaska. The Polish alto sax and bass clarinet player sounds very different from Parker, boisterous and soulful, more like Peter Brötzmann or Ken Vandermark. It’s also striking what a remarkably consistent player Trzaska is. Often, even the best musicians find it hard to reach their optimum level, but he’s able to maintain a high batting average in a variety of contexts (check out Stef’s deep dive on him here). The combination of the two saxophones can be heard in the opening track, the forty-three minute “Hunting Moon”. 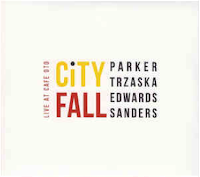 When Trzaska joins Parker just over half-way through, their phrasing is so interlocked and focused that they sing as in a choir – the ever-changing nuances and contrasting tonalities suffusing each other, creating a finely woven mesh. Shortly after that bass and drums drop out and the sax lines artfully overlap, revealing distinct musical colours. The music on City Fall is a testament to a deep affinity, a shared consciousness and respect, referring to a tradition that goes back to the early days of European free music. The best example is the encore “Eternity for a Little While“, beginning with Parker and Trzaska in a saxophone duet, with the latter starting a swinging lick, before the others literally saw it up. City Fall - Live at Cafe Oto is a perfect example of how a real unit can work. Edwards and Sanders are like a V 12-cylinder engine boosted to - say - 700 horsepower, with turbochargers in the shape of the two horns. Unfortunately, the album - a double-CD - was released on 23rd December, 2016, so it didn’t make it into my annual Top Ten. It’s definitely one of last year’s best releases.